This WB6 wire binder is designed to punch, bind, and close your documents to a professional standard. Compact and versatile, this 3:1 wire double-loop machine will bind up to 30 sheets of letter size paper. It will also punch 32 square holes in a smooth and perfect sequence through 6 pages of 20 lb paper at a time and can even punch a sheet of Clear PVC 180 micron sheet. The adjustable paper stop guide will prevent waste and will ensure a perfect bind, every time. Compact and convenient, the WB6 Personal Wire Binder can be easily placed on a work desk, and thanks to the integrated hidden chip tray, it will maintain a clean work area. Plus, the lockable handle makes the machine smaller, so you can save storage space. Whether you're a young professional, a grad student, or if you simply need a binder for occasional use, this machine is ideal for you. Capable to punch up to 6 sheets of 8 1/2 x 11"
Binding Size: 8 1/2 x 11"
I am very happy with this Papermonster. It cuts the paper smoothly and the price was very reasonable. I love the compact size of the machine for storing until I need it. Was just what I wanted. But in using found out the holes could be a bit bigger. Not a lot of room for turning pages. Used the Proclick spines that was sold in the same ad for it. Hope it will work better with the coil spines. I have not had the chance to use this product. I did buy it for the closer for making calendars. Actually bought it for the closer. I make lots of calendars and the closer on my punch machine is getting worn out. Was impressed with the quality for a small machine. Didn't realize it was made by Martin Yale until I opened it. I have other Martin Yale products and am very satisfied with them. I am really excited to use this for school! The "monster" doesn't breathe fire nor swallow victims in a single bite but by taking many bites of a few pages it provides a means of making frequently flopping pages of music books lie flat and turn easily. Most of my music is in no longer published versions and have generations of frequent use. By removing staples and slowly band sawing the bound edges, we have been able to salvage and extend the usable life for the next generation. The monster handles only 1/4 coils and falls short for for most music book thickness. Closing larger coils by hand is a painstaking process with varying results. It still beats a 3 or 4 hole step punching mechanism. For small quantities it is well worth the small investment and the extra effort to assemble 9/16" coils. Unfortunately, the ProClick spines require slightly larger holes than this machine will punch. The holes are spaced the same, but the tighter holes make the pages difficult to turn when used with ProClick spines. This binding machine is pretty good, but would be much better if it could crimp different sized spines. This is great for little projects. If you are looking for a 3:1 punch and aren't concerned about only punching a few sheets at a time, this binder will work great. The crimping tool will only work with 1/4" (6mm) wire loops. It will not crimp other sizes. If you need to bind larger projects, you will need to use binding spines that do not need to be crimped... like a ProClick spine or a 3:1 spiral. The 1/4" binding wire would be a perfect size for binding monthly wall calendars. It's also worth mentioning that you cannot turn off any of the punch positions. This is really only important if you need to punch pages smaller than 11 inches and are concerned with holes running over the edge of the paper. It does the job, but it is time consuming to feed/punch 4-6 sheets at a time. I went with the 3:1 coil rather than the double-loop wire (which tend to rust in our climate), and the coils work just fine. Great price and gets the job done. The machine only does one size though which is a bit of a bummer. Might look at upgrading sometime to one that does s more sizes. Welcome to MyBinding video. This is the PaperMonster WB6, a complete 3:1 pitch personal double-loop wire binding system. Built for the home or small office, you can do the whole thing right here. With your papers all in order and your wire bind selected up to one-quarter inch, release the lock on the top of the machine and lift the handle. You always want to start with scratch paper to set the side margin control knob to make sure that when you make your punch, everything is even on both ends. There’s also a measuring tool and guides to help you in your centering. And now you can begin with your covers. Push them face down or face up, just do everything throughout your project the same. Continue to punch through your entire project, punching up to six sheets of 20-pound paper in small batches. Once you’ve punched through all your pages, assemble your book in order, choose your wire, it’s time to bind. You can use the little fence on the face of the machine to drape your wires on the small needles pointed up. A trick in wire binding is to take the back page and flip it around to the front so it faces front to back. This way, the seam in the wire, when it’s closed, will be hidden inside your book. Thread all of the teeth with the holes in your project. Make sure they go all the way in. Then, with the “C”, the open “C” shape, push it into the back of the throat opening. This is the wire closer. This machine can handle up to a one-quarter inch wire, which is around 45 sheets of 20-pound paper. It’s that simple. Your book is bound and it looks great. All of the punched holes fall into a cavity in the base of the machine and it is emptied through this little window here. That’s it. That’s the PaperMonster WB6. For more demos, reviews and how-tos, check out MyBinding.com. I understand that you can only punch 6 sheets at a time. My question is.... What is the most sheets you can bind together 45 or can it be more? Thank you for your question. The Papermonster 3:1 Personal Wire 32 Double-Loop Binder - WB6 will bind up to 30 sheets of letter size paper. Will this product punch through vinyl records? Thank you for your question. The Papermonster 3:1 Personal Wire 32 Double-Loop Binder would not be able to punch through a vinyl record. You would need a much more robust machine to be able to punch through a record. I received my binding machine with 1/4" wire bind and I love it. However, my box says it can do 1/2" wire bind (45 pages). Which one is correct? Reviews and online say 1/4", I just want to make sure before I buy 1/2". Thank you for your question. The Papermonster 3:1 Personal Wire 32 Double-Loop Binder will only be able to close the 3/16" and 1/4" sized wires. Hello! Does this order come with any extra supplies (spines)? Thank you! Thank you for your question . The Papermonster 3:1 Personal Wire 32 Double-Loop Binder does not include any supplies. It can use either a 3/16" or 1/4" 3:1 twin loop wire. What are the different page sizes that are on the side margin control knob (on the left of the machine)? Thank you for your question. The Papermonster 3:1 Personal Wire 32 Double-Loop Binder is set up to punch along the 11" side of standard letter sized paper. The margin control on the left side of the machine allows you adjust the left/right justification of the holes so you can be sure the spacing from the edge of the page is even. Hi, I'm thinking on buying this machine Papermonster 3:1 Personal Wire 32 Double-Loop Binder - WB6 for a home/office small use, my questions is can I use wire and plastic spines? Can I be able to open the spines with this machine to add more pages later? Thank you for your question. The Papermonster 3:1 Personal Wire 32 Double-Loop Binder is designed to work with 3:1 twin loop wire which are made out of metal. You can custom order 3:1 plastic coil that would work with it but you would also need a pair of crimping pliers to crimp the end of the plastic coil. With a wire opening tool you can open a wire bound book to edit it but you would need to use a new wire to rebind the book as the opening process would kink and bend the wire. Can I punch a 6" wide calendar with this machine without it making partial holes on the edges. It doesn't matter to me if I can't disengage any of the punches, I just need to know if a 6 or 6.5" wide calendar would work out with the holes? Thank you for your question. Because the Papermonster 3:1 Personal Wire 32 Double-Loop Binder does not have dies that disengage there is not a way to guarantee that documents smaller than letter sized do not have the half punches on the edge of the page. Will this punch work with Proclick spines, and how does this compare to the GBC P50? Thank you for your question. The Papermonster 3:1 Personal Wire 32 Double-Loop Binder would work with Proclick spines, they both have the same 3:1 spacing. 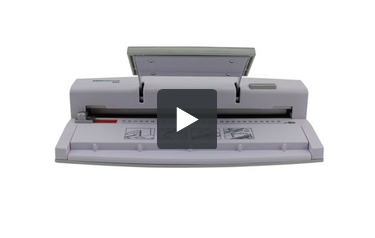 It is very comparable to the GBC P50 as they are both "entry level" binding machines design for light use. They both can punch up to 6 sheets of standard 20# copier paper. I purchased the paper monster wb6 along with the 3/8" 3:1 pitch twin loop wire but I cannot fit the wire into the binder in order to bind my project. Is something wrong? The Papermonster 3:1 Personal Wire 32 Double-Loop Binder is only able to use up to 1/4" diameter spines. Unfortunately 3/8" spines are to big for this machine and will not work with it.